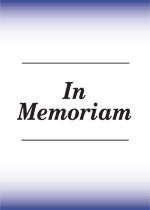 Richard A. Rickett, 81, of Hermon, died April 15, 2011, at his home. Allen-Denesha Funeral Home, DeKalb Junction, is in care of arrangements. Calling hours will be Tuesday, April 19, 2011, 2 – 4 and 7- 9 p.m., the funeral service will be Wednesday, April 20, 2011, 1:00 p.m. at the funeral home, Reverend William Hart officiating, burial will be in Hermon Cemetery. Richard is survived by a son, John (Donna) LaTray, Canton, Bonnie (Willy) Walton, DeKalb Junction, Nina Plaisted (fiancé Michael Polowchena), Hermon; eight grandchildren; 23 great-grandchildren; several nieces and nephews. He was predeceased by brothers, Howard and Douglas Rickett; sisters, Ruth Woods, Doris Pearson, Audrey Klock and Stella Leeson. He was born March 26, 1930 in Fowler, the child of George F. and Nina G. Fuller Rickett. He married Evelyn Fayette on January 8, 1952 in the Town of Pitcarin, she died September 20, 1996. He was a warehouse manager for Farley Equipment in Gouverneur. He loved to mow his lawn, tinker with things, watch classic movies, read Louie Lamoure books and had a lot of collectibles. Contributions can be made to Hospice and Palliative Care of St. Lawrence Valley or the Hermon Volunteer Rescue Squad. E. J. Bango, DeKalb Junction, child of Miranda and Robert Bango, Allen-Denesha Funeral Home, DeKalb Junction in care of arrangements.